The most commonly used type of cylinder is a single rod cylinder. In this case, there is only one piston rod attached to the cylinder piston and it extends out of the head end of the cylinder. 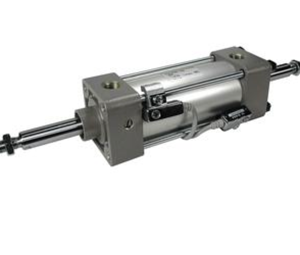 The most important consideration of a single rod cylinder is that the force the cylinder can exert changes depending on whether the cylinder is being retracted or extended. The extend force is calculated by finding the area of the bore and multiplying by the operating pressure. The retract force is calculated by finding the area of the bore, minus the area of the rod, and then multiplying be the operating pressure. The other type of cylinder is a double rod cylinder. In this case there are piston rods attached to both sides of the piston and extend out both heads of the cylinder. Some of the advantages of a double rod cylinder are that work can be done on both sides of the cylinder, and the force is equal in both extend and retract for the same operating pressure. Some customers are even able to simplify their hydraulic circuitry to use regeneration, as the volume of fluid needed to fully stroke the cylinder is the same on both sides of the piston. Some of the downfalls to double rod cylinders can be increased cost due to the extra rod length, seals and gland, and extra space needed for the additional rod coming out of the cylinder. It also should be noted that some mounts are unavailable for a double rod cylinder, such as a clevis, pivot and rear flange mount. It may seem like a simple decision early on in the cylinder design process, but choosing whether the cylinder will be a single or double rod will have lasting impacts on the cylinder as the design progresses.